The Intense Series 1000 diode lasers have high CW output power, high brightness and the excellent reliability needed for today’s industrial applications. Selected wavelengths are available within the range of 700 nm to 880 nm. The lasers are broad area multimode with source apertures from 50 µm to 470 µm and spectral widths of typically 2 nm. 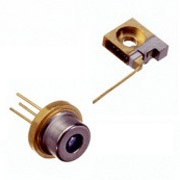 Lasers in the Series 1000 exhibit high quantum efficiencies and low thermal impedance for extended lifetime and reliability. Availability in all industry standard packages including optional fiber coupling. Applications for these diode lasers include solid-state laser pumping, free space communication, medical therapy, imaging and diagnostics, robotics and illumination.